Goodreads says, "Julia and Eliza are best friends, spending the summer together. Julia's mother is serving in the National Guard and Julia spends all of her time trying not to think about what could happen. So the girls lose themselves in their summer, hanging out at the resort where Eliza's father works. But when they meet a new boy, neither one of them is prepared for what it does to their friendship. Nora Raleigh Baskin delivers a poignant look at the way a first crush can come between best friends and the importance of hanging on to the time you have as a kid before rushing into growing up." *It comes with no surprise that I am obsessed with summer/beach reads and this one sounds like something I'd enjoy. Plus, I love the last line in the synopsis about holding onto your childhood for as long as you can. Isn't that the truth!?! Oooh, I LOVE the sound of this one. It's going on my wish list for sure! Good pick! I enjoy beach reads too, especially at this time of year when it looks like summer will never arrive. I can't wait to read this one either! I have it on Galley Grab and I plan on starting it soon! Great choice this week! I love the cover on this one - it looks great! I haven't heard of this one, but I will be adding it to my list now. I am slightly in LOVE with summer reads now thanks to The Summer I Turned Pretty series! I love summery beach reads too!! This one sounds good. I love summer/beach reads, too...so many good ones coming out soon! I love books that take place during summer and that akward part of being a teen. :) Must be why I like Sarah Dessen so much. Looking forward to this one! Ooooh this is an S&S Galley Grab book, sounds good I might have to get it. this cover is stunning!! sounds great too! I am really looking foward to starting this book, it sounds really awesome. And I love the cover too! YAY for another contemporary books. I think I should also download it from grab galley. Oh, that sounds so poignant, LOL, I know tht sounds cheesy but true! The cover kind of gets me, too. 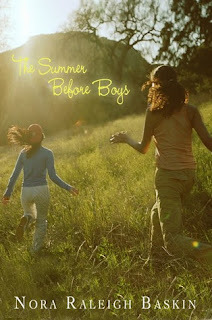 I'll be putting this one on my TBR list for my summer read! I'm a new follower and I'd love for you to come by! This looks like a really sweet story and the cover is so pretty. Great choice! Aww looks really good.Sounds kinda sad. It's going on my TBR list.